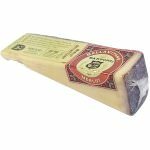 The Drunken Goat or Murcia al Vino is a young Spanish goat's milk cheese that is soaked in Monsatrell Wine for 48-72 hours and then aged for a couple of months. This incredible goat cheese is made the Murcia region of Spain, which is on the Mediterranean coast. 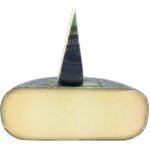 When you taste this gourmet cheese you will experience a mild and rich flavor, and clear sweet and spicy finish from the wine. But while very interesting the wine flavor remains subtle and doesn't over power the cheese. It's very delicious for nibbling on. 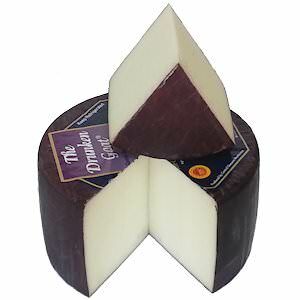 The Drunken Goat has a elastic and brilliantly white interior and a smooth dark violet rind. 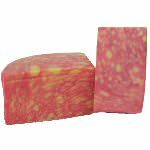 Ingredients: Pasteurized Murciana goat's milk, salt, rennet, cheese cultures, rind bathed in Monastrell wine.